This is a draft version of a short essay which will appear in a book accompanying ‘The Sixties: A Worldwide Happening’, an exhibition being organised by the Nationaal Museum van Wereldculturen in the Netherlands. Fanon – like many left-wing intellectuals around the world – looked to Cuba with high expectation. Seizing power on the Caribbean island in 1959, Fidel Castro’s 26 July Movement had toppled the Batista dictatorship and promised to end inequality and bring social justice. Cuba’s hold on the imagination in the West and the East was perhaps greater than the size of the island or its population might warrant. But its proximity to the United States, and the extent of popular support for communists like Castro (unlike, say, in Eastern Europe where the seizure of power had been achieved in the late 1940s through murky machinations and menace) added much to its global importance. Moreover, the guerilla war to oust Batista exploited – like no other revolution before it – the power of the image. Castro’s revolutionaries, small in numbers, achieved the ‘media effect’ of amplification by performing horseback parades and gun salutes for the cameras of the world’s media. And once in power, Cuban films, magazines and posters continued to trumpet the values and the achievements of the revolution abroad, in forms which were no less vivacious even when reporting sugar cane harvests. Although often screen-printed on cheap paper, Cuban posters of the mid-1960s drew enthusiastic praise around the world for their vivid fields of colour and uninhibited designs. They were generally created by designers on the books of official agencies such as Comisión de Orientación Revolucionaria, the publicity wing of the Communist Party and Instituto Cubano del Arte e Industria Cinematográficos which issued posters to promote films. Printed in large numbers (more than 5 million posters in one year, 1972) and in a great plurality of styles (from portraits of workers in the socialist realist manner to fashionable Op Art aesthetics), they formed the visual environment of post-revolutionary Cuba. They also travelled well: Cuban posters were shown in galleries on both sides of the Cold War divide and reprinted in large format anthologies within a few years of the revolution. 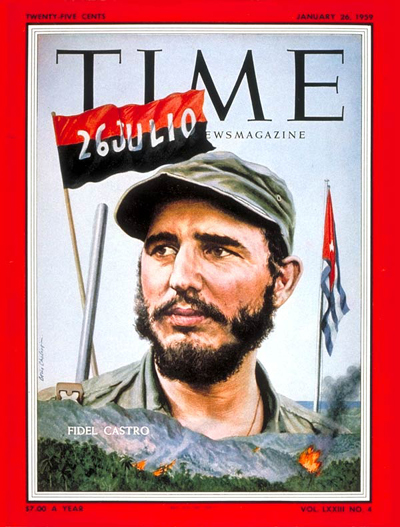 The diversity of poster styles, it seems, was living proof of Fidel Castro’s promise to cultural workers made in 1961 to withdraw from questions of artistic form, in exchange for party control of content. Although writer Susan Sontag argued that undisciplined aesthetics lacked the rigour required to be truly revolutionary, she traced the contours of freedom in their hedonism: ‘These posters give evidence of a revolutionary society that is not repressive and philistine … a culture which is alive, international in orientation and relatively free of the kind of bureaucratic interference that has blighted the arts in practically every other country where a communist revolution has come to power.’ In other words, these posters were proof that Cuba was not the Soviet Union, with the paranoia, conservatism and despotism that Brezhnev’s rule entailed. Castro presented the Caribbean island as the friend of small nations living in the shadow of aggressive neighbours and a sanctuary for revolutionaries around the world. Black leaders in the United States were drawn, with Havana’s encouragement, to Cuba, particularly after the explosive Watts Riots in Los Angeles in August 1965. Black Power activists including Stokely Carmichael and Eldridge Cleaver left the USA for Cuba in 1967 and 1968, before being given passage to Africa to agitate for their visions of pan-Africanism there. In 1966 Cuba hosted the Tricontinental Conference in Havana to promote ‘solidarity with the Third World people’s struggles, claims and most precious desires.’ Under a neon sign of fist clenching a gun fixed above the entrance of the Havana Libre hotel, representatives from more than 50 countries gathered to express their opposition to imperialism and neo-colonialism. There was little consensus about what to do next, except perhaps to express solidarity with the people of Vietnam. In his concluding address, Castro drew attention to the resistance being encountered by half a million well-equipped American troops fighting in Vietnam: ‘To the amazement of the world, the people of Vietnam are furnishing the most extraordinary example of heroism the history of any liberation movement has ever seen, because a liberation movement has never had to face more powerful forces. The people of Vietnam are reversing these forces and defeating the might of the Yankee imperialists’. Following the conference, OSPAAAL – Organización de Solidaridad con los Pueblos de Asia, África y América Latina (Organisation of Solidarity of the People of Asia, Africa and Latin America) – was formed. Engaged in various forms of propaganda activity, OSPAAAL was a major publisher of posters with messages in Spanish, English, French and Arabic. Opposition to the influence of USA was a mainstay of OSPAAAL designs, as was support for indigenous peoples and left-wing governments in the three continents. Faustino Perez and Ernesto Padron’s ‘Day of Solidarity with the Peoples of Puerto Rico’ (1968), for instance, marks an objection to the Americanisation of Cuba’s near neighbour, with a precolumbian trigonolito (carved three-corner stone) – perhaps representing a Taíno deity – putting well known corporate logos to the torch. Such posters were folded into copies of Tricontinental, an OSPAAAL magazine which was distributed to libraries and other subscribers in more than eighty countries around the world. A supplement to the magazine, these designs were less attempts an attempt at persuasion than, perhaps, a matter of confirmation for its readers. The idea of revolution had high currency around the world in the late 1960s, not least in the West. There, the conviction that society could be dramatically reorganized at a stroke – motivated a new generation disenchanted with the divisive effects of post-war affluence. Revolutionary images were adopted in the modish fringes of consumer culture. In ‘Street Fighting Man’, Mick Jagger of the Rolling Stones, for instance, sang about his excitement of witnessing demonstrations around the world from the perspective of ‘sleepy London town’. Posters promoting liberation movements and their leaders – not least Ernesto ‘Che’ Guevara – formed backdrops for fashionable lifestyles in the West. As Sontag noted, consumption in capitalist societies is based on appropriation: ‘counterrevolutionary societies … [have] a flair for ripping any object out of context and turning it into an object of consumption’. Cuba was not the only communist country which issued posters protesting against American involvement in Vietnam. Chinese and Soviet authorities did the same, often in images which stressed the unbreakable bonds of international solidarity and other clichés. Rather more compelling were those anti-American images produced in the United States by artists who identified with the emergent counter-culture. 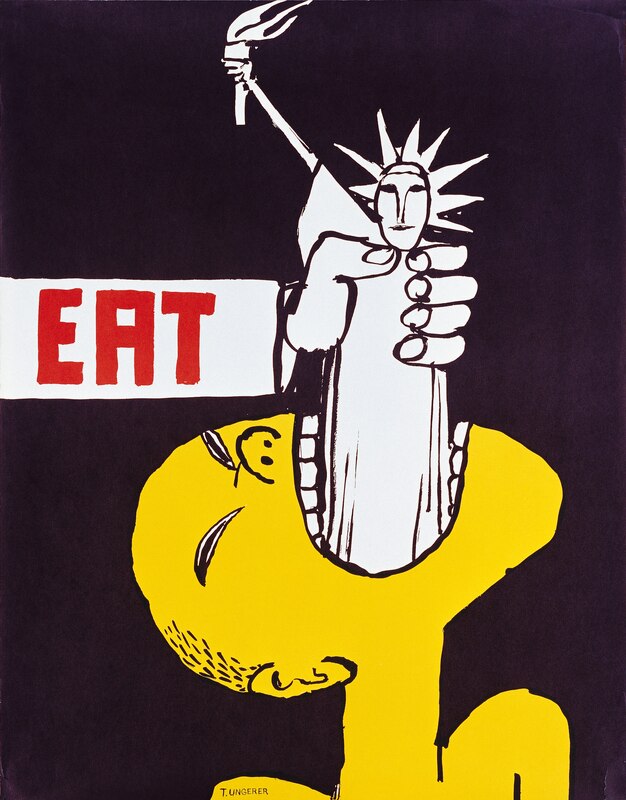 In a much reproduced 1967 poster, celebrated graphic designer and children’s book illustrator Tomi Ungerer depicted the symbol of welcome to the United States, the Statue of Liberty (a figure who announces to the world, ‘give me your poor, your huddled masses, yearning to breathe free’), as a symbol of violence. A Vietnamese figure is compelled to consume this American gift with the bold injunction ‘EAT’. The emphasis suggests a second critique of American foreign policy: in asserting freedom around the world in the face of the spread of communism, Washington was demanding the conditions in which people would become free to consume American commodities. Making a clear opposition to the actions of the Pentagon and the White House in Indochina, the poster has been criticized for representing the people of Vietnam as victims, when, in fact, the Vietcong (North Vietnamese forces) were – as Castro had argued a few months earlier – proving to be very difficult to overcome. 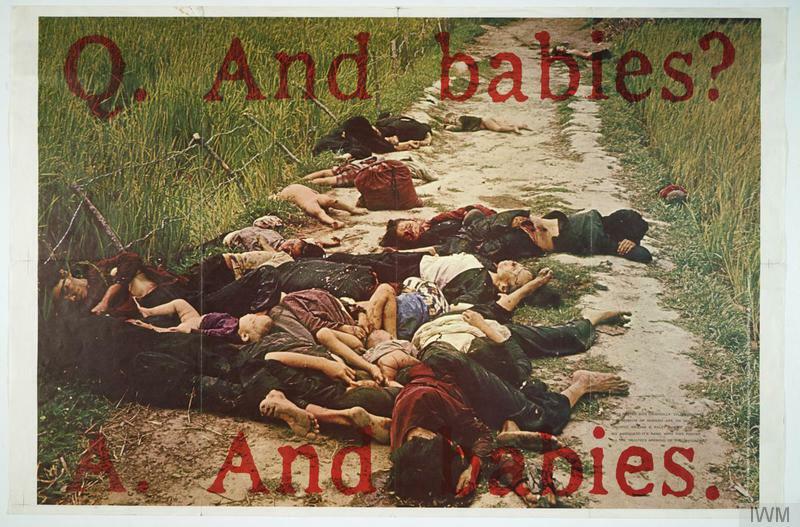 Another anti-war image produced in the United States also emphasized the victimhood of the Vietnamese. In 1968 a troop of US soldiers massacred the population of a Vietnamese village, Mai Lai. The 106 people who died in this brutal episode were initially described by a US army spokesman as a Vietcong unit. The evidence provided by the Army’s own photographer revealed, however, that men and women, old and young, had been killed indiscriminately. The images of the dead, as well as other shots of peasants recoiling from the menacing GIs, found their way into the American mass media. They were shown on the major news broadcasts without commentary, such was their shocking force. The images appeared at a time when American attitudes to the war were already changing. And for the anti-war movement, here was brutal evidence of indifference and violence done to the very people America was claiming to protect. The Art Workers Coalition – an alliance of politically-engaged artists in New York – published ‘And Babies?’ a poster based on an image that had caused a storm of controversy when it had been broadcast on American television. What is more, the artists returned this image back to its mass-media home by parading for the world’s media in front of Pablo Picasso’s ‘Guernica’ (1937), one of the most compelling anti-war images of the twentieth century, at the Museum of Modern Art in New York in 1970. Here, the process of what Sontag called ‘ripping’ an image was put to critical effect. Another indictment of the United States frequently-made by its enemies concerned the segregation and discrimination against black Americans. 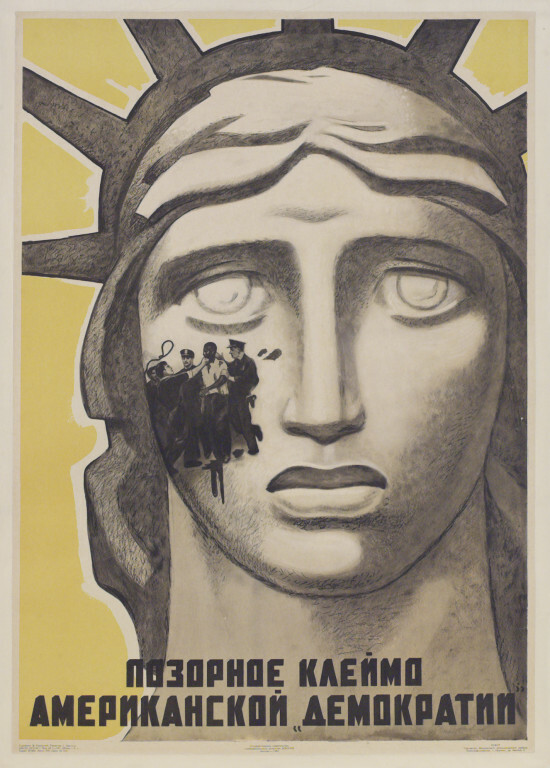 Viktor Koretzky’s 1363 poster, for instance, combined the historic symbol of American freedom, the Statue of Liberty, with a scene of licensed brutality. A group of uniformed officials — perhaps police officers — appear to be lynching a black man, a fate suggested by the ominous presence of a noose. Produced during the height of Civil Rights protests, the Soviet poster pointed out the failings of American democracy (and was, as such, a direct riposte to Washington’s claims that the Kremlin denied fundamental human rights to the citizens of the Soviet Union). Civil rights and international solidarity combined in the posters issued by the Black Panther Party which was formed in the USA in 1966. 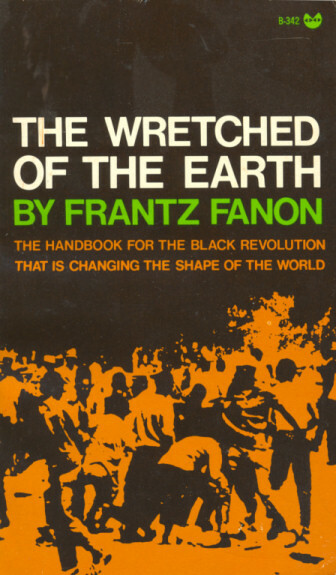 Founders Bobby Seale and Huey Newton professed deep admiration of Fanon’s The Wretched of the Earth. Advocating armed patrols to monitor and challenge Police brutality as well as other public services such as free meals for poor children and opposition to the military draft (which called up a disproportionate proportion of black Americans), the membership of the Black Panthers grew rapidly across the USA. Eschewing the non-violence of earlier civil rights activists in favour of what it called ‘self-defense’, and styled in uniforms of berets and leather jackets and bearing arms (legally), the Black Panthers attracted considerable publicity. In fact, the Black Panthers were skilled communicators – issuing a manifesto (aka ‘The Ten Point Program’), publishing a newspaper (reaching a circulation of 250,000 copies) and of course, leaflets and posters. 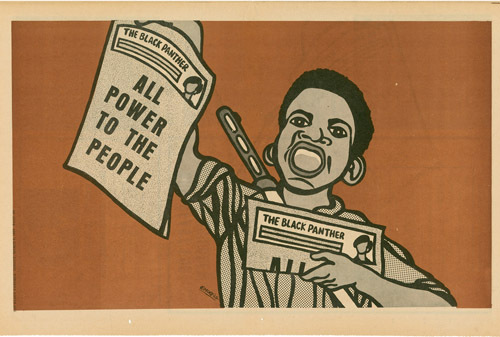 In ‘Afro-American Solidarity with the oppressed People of the World’ (1969), designer, Emory Douglas, made a clear connection between the interests of African-American people and those living in the Third World. Produced at a time when the leadership of the Black Panthers wanted to put a halt to common sexism in its ranks, this revolutionary — displaying her black pride in her Afro hair and militant posture — carries both a rifle and a spear, and like a superhero, lines of light radiate from her body. With typical ambition, Douglas is identified as the Minister of Culture and the publisher as the Black Panthers’ Ministry of Information on the poster. And, as if to fulfill this dream of statehood, Black Panther delegations visited marxist North Vietnam, North Korea and China in 1969 and 1970. Poster issued by the Committee to Defend the Panthers. Unsurprisingly, the organization seen as a threat by different branches of the state and the legal system in the USA, not least the FBI which mounted a campaign to discredit the organization. Numerous attempts to prosecute Black Panthers failed, a fact which drew high-profile liberal supporters to the group. Most prominent among them was composer Leonard Bernstein who held a fund-raising party in 1969 for twenty-one Black Panthers accused of ‘conspiracy to murder New York City policemen and to dynamite five mid-town department stores, a police precinct, six railroad rights of way and the New York Botanical Gardens.’ This event was lampooned by Tom Wolfe in a biting account in New York Magazine in which city’s glittering elite rubbed shoulders with leather-jacketed revolutionaries over cocktails and ‘little Roquefort cheese morsels’. Artists Donald Judd. Frank Stella, Nancy Spero, James Rosenquist and Roy Lichtenstein amongst others gave works for a fund-raising auction in a Manhattan church. 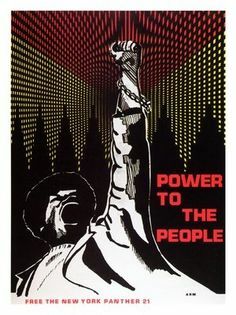 In spring 1971 John Lennon / Plastic Ono Band released ‘Power to the People’, a variation of a Black Panther slogan which featured on this poster issued by the Committee to Defend the Panthers. Designed by Richard Earl Moore (Dhoruba al-Mujahid Bin Wahad), one of the defendants and a member of one of the most active and socially engaged Black Panther chapters in New York. When the eight-month trial concluded in May 1972, the Panthers in the dock were acquitted after the jury deliberated for less than one hour. The testimony of three undercover police officers had been entirely unconvincing. With its raised fist and broken chain, Moore’s design trades in clichés but it also holds rare authority as the creation of an artist who lived the experience it depicts. Fanon, Wretched of the Earth, 199. Fanon, Wretched of the Earth, 76. See, for instance, Lee Hall, ‘Inside Rebel Cuba with Raul Castro’, Life (21 July 1958), 29-35. See also Richard Gott. Cuba. A New History (Yale University Press, 2005) 160-4. 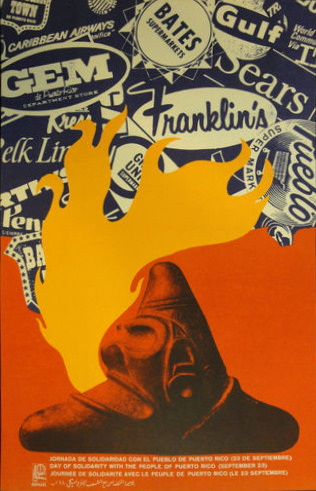 For a survey of Cuban posters see Lionel Cushing, Revolucion! 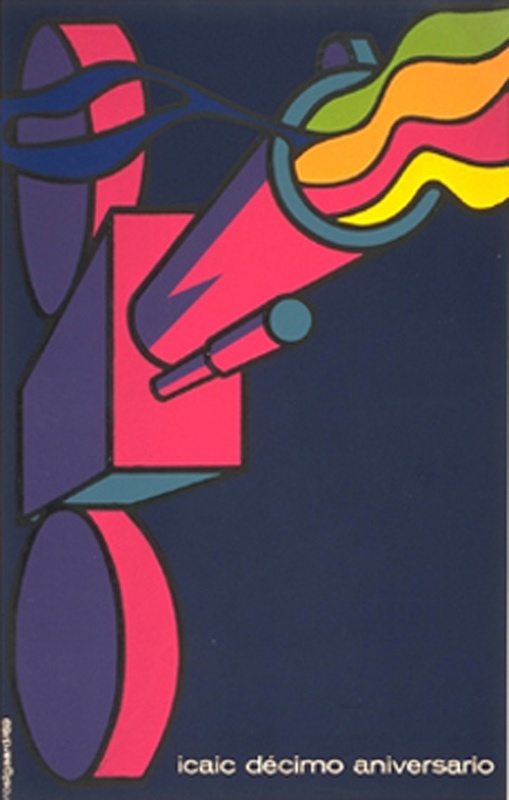 Cuban Poster Art (Chronicle Books, 2002). See Cubaanse Affiches (Amsterdam: Stedelijk Museum, 1971); Dugald Stermer, (ed. ), The Art of Revolution: Castro’s Cuba, 1959–1970 (London, 1970 ). Susan Sontag ‘Posters: Advertisement, Art, Political Artifact, Commodity’, in Stermer, The Art of Revolution, p. xxii. See David Kunzle, ‘Uses of the Portrait: The Che Poster,’ in Art in America, 63, n. 5, (Sept-October 1975) 63-73. Sontag ‘Posters: Advertisement, Art, Political Artifact, Commodity’, in Stermer, The Art of Revolution, p. xvii. See Jeffrey Walsh and James Aulich, Vietnam images: war and representation (London: Macmillan, 1989) 115. See Stephen Howe, Afrocentrism: Mythical Pasts and Imagined Homes (London: Verso, 1998) 77-78. 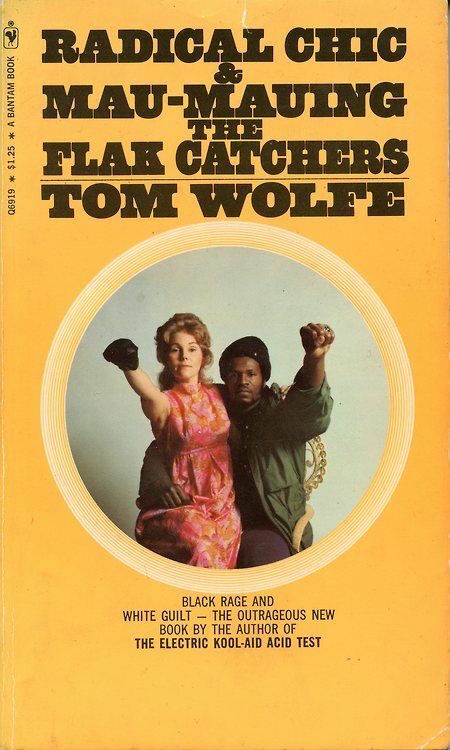 See Danny Glover and Kathleen Cleaver, The Black Panther Party for Self-Defense. The Art of Emory Douglas (New York: Rizzoli, 2007). An article in the New York Times (21 December 1969) listed 23 significant arrests and raids by the police on BP leaders and offices in 1968 and 1969 which did not result in successful prosecutions – see Charter Group for a Pledge of Conscience, The Black Panther Party and the Case of the New York 21 (New York, nd). Dhoruba al-Mujahid Bin Wahad’s freedom was shortlived. He was arrested again within weeks of his acquittal and prosecuted for the attempted murder of two police officers. He served 19 years in prison before being released in 1990 when a judge agreed to a retrial. In 1995 the Manhattan district attorney’s office stated that it would not pursue the case. With evidence that he had been the subject of a FBI smear campaign and that the prosecution had withheld evidence in the original trial, the FBI and the City of New York agreed to pay Dhoruba significant damages.